Sewer and drain backup are causing problems for businesses in Salem, New Hampshire. 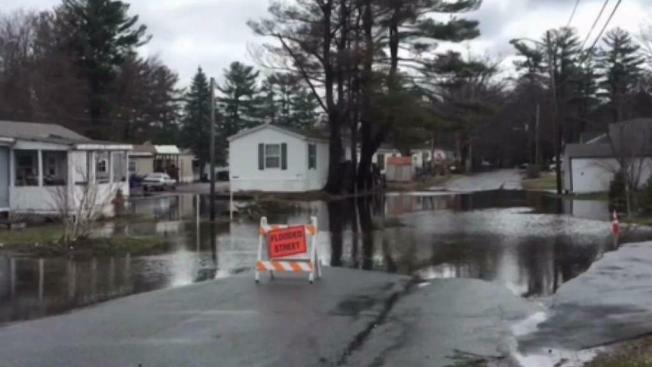 Sewer and drain backups have been causing problems for the town of Salem, New Hampshire. Last week, sewage flooded several businesses bathrooms and man holes on Main Street. One of the operations hit hardest by the overflow was the Salem Fire Department. "We couldn't use running water," said Assistant Chief Larry Best of the Salem Fire Department. Intense rains that dropped three inches of water on Salem in 12 hours on April 16 caused the water inside the fire department to be shut off. "If we have uniforms that get contaminated with blood, then we have to bag them up and we take them to one of the other fire stations and have to launder them there," Best said. The situation lasted for two days after the heavy downpour last Monday that crippled Salem's outdated sewer and drain system, causing it to back up and flood in the Main Street area. A number of businesses in the area were impacted, including Rite Aid and Giovanni's Pizza. "When you get rain fall or wet weather like we did, it's just excessive and it can't handle it," said Roy Sorenson, the municipal services director in Salem. The town does have a solution, an $11.6 million, 2-year project that begins at the end of May. The project will replace the water and sewer mains with almost two miles of new piping from North to South Broadway. It will also replace a culvert, an underground pipe system. Sorensen said another arm of this project will include a "I and I," or infiltration system. "The pipes will be larger it will be able to handle more capacity," Sorensen said. For now, the firefighters said they have a plan in place while they wait for the fix. "To have Porta-Potties brought in again, to also consider looking at portable shower units to bring, as well," Best said.